So, while I think about food all. day. long. sometimes I just don’t have time to make myself a full, healthy meal right when I want it. Time keeps moving and sometimes Hank just can’t wait for his walk, or I catch myself starving and realizing I haven’t eaten enough during the day. I can go from zero-to-hangry in no time, and usually, my hunger comes along with a headache – not a fun combo! For moments like these, I like to have some sort of energy bite or fat bomb on hand to help fuel me until I can get a meal down on the table or to hold me over until breakfast before I head out for a walk with Hank. I like to switch it up and this week, instead of turning to one of my usual go-to’s (like these Cacao Peanut Butter Fat Bombs ) I decided it was time for a new recipe, and I was feeling like something a little fruity this time around. I threw these together and hoped for the best and they turned out wildly delicious. The ingredients and flavors I used are reminiscent of my Strawberry Shortcake Bars – a major favorite of mine and an often-raved about recipe by you guys as well. 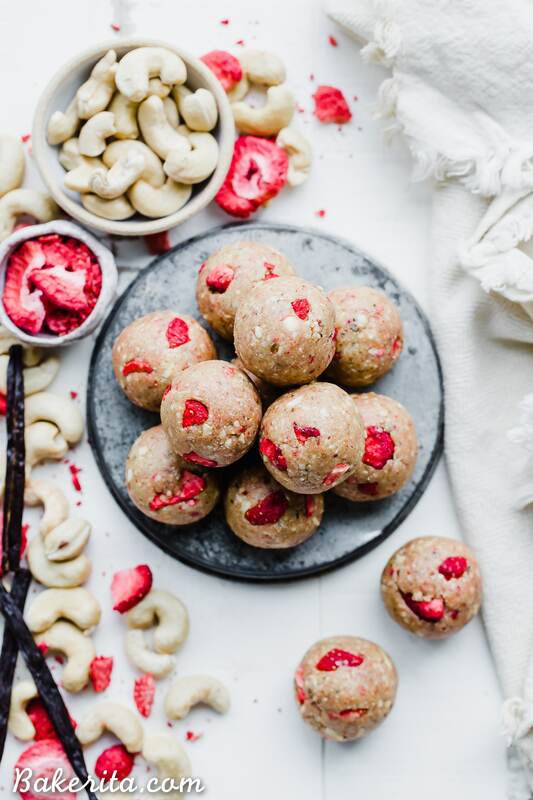 Strawberry Vanilla Bean Energy Balls! Turns out, those flavors and ingredients make an amazing energy ball too! Like all of my balls and bites recipes, these come together super quickly too – the most time-consuming part of the whole process is rolling the balls (and honestly, if you’re feeling lazy, just scoop ’em and leave them be, it’ll taste the same!). They’re made in a food processor or high-powered blender. I always use my Vitamix because I don’t have a food processor. 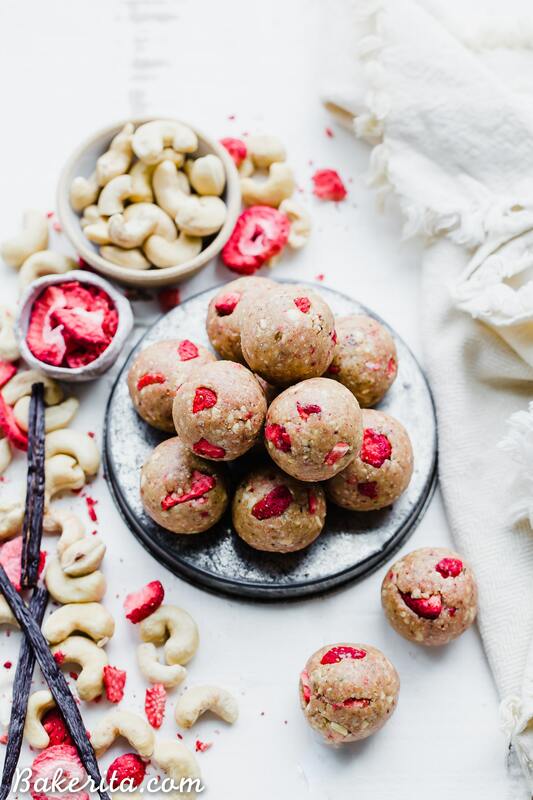 The raw cashews, shredded coconut, cashew butter, coconut oil, hemp seeds, dates, vanilla bean powder, and salt are all combined and blended until they come together into a sticky dough. Once everything’s come together, the freeze-dried strawberries are either pulsed in or stirred in, adding their sweetness and fresh fruity flavor (and some cute pink streaks through the dough). Scoop or roll into balls, and that’s all. They’re done in 15 minutes MAX. 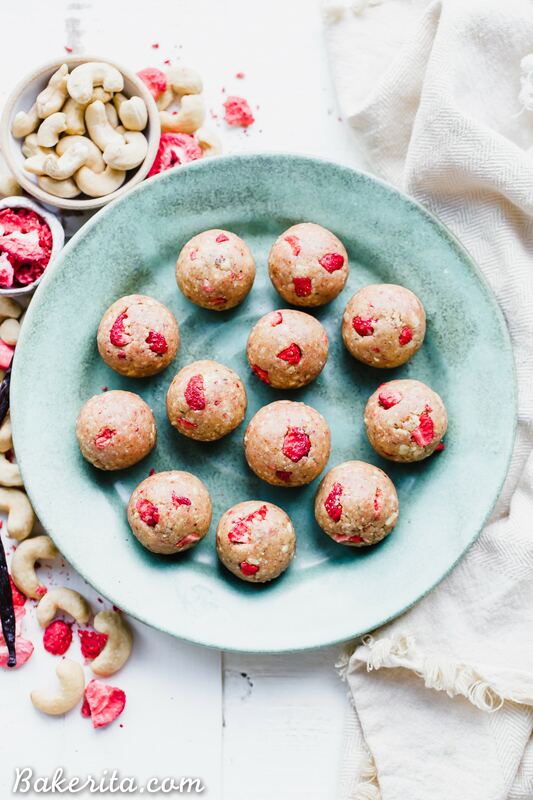 These Strawberry Vanilla Bean Energy Balls are an easy, no-bake snack that tastes like strawberry shortcake! 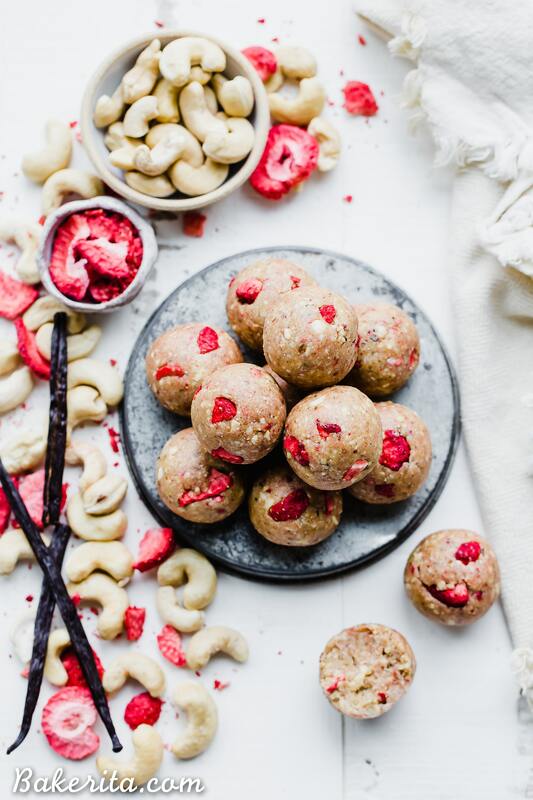 With a base of raw cashews, they're buttery and deliciously flavored with vanilla and strawberries. They're gluten-free, paleo, and vegan, and perfect for bringing on the go. In the bowl of a food processor or a high-powered blender (I used my Vitamix), combine all of the ingredients except for the freeze-dried strawberries. Pulse for about 1-2 minutes, until the mixture starts to break down. It will first become powdery and will stick together, but still be crumbly. Keep processing until the oils start to release a bit and the mixture sticks together easily - just be careful not to over process or you’ll have nut butter. If your mixture seems a little dry, you can use a little extra coconut oil to help it come together. Once the mixture is sticking together well, pulse in the crushed freeze-dried, just to incorporate them. You can also just stir them in. Use a small cookie scoop (I use this one) or a tablespoon scoop to divide the mixture into equal pieces. Use your hands to roll into balls and place on a plate. I hope that you love these, Brittany! These are absolutely amazing! They taste so creamy and smell so heavenly. I just made my second double batch and my kids are obsessed with them! Just made the strawberry cashew butter you posted yesterday and used that in this recipe for an extra dose of strawberry – sooooo good! Thank you!!! 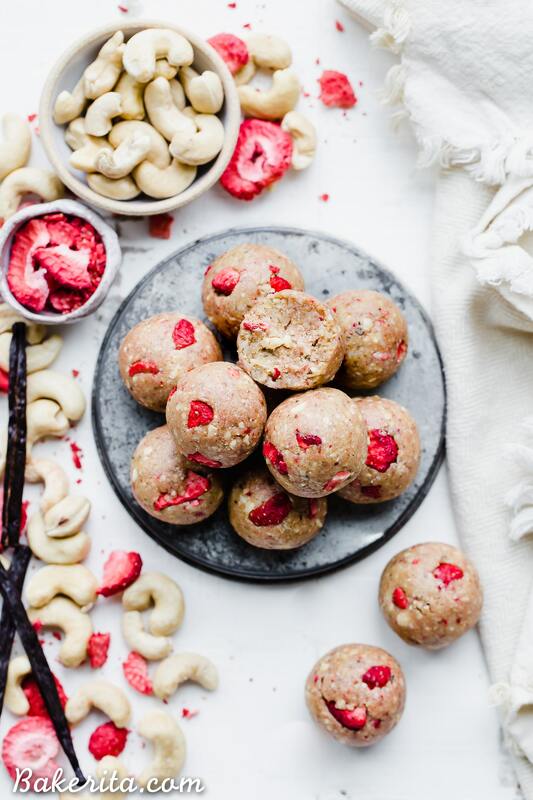 OMG they sound amazing with strawberry cashew butter – YUM! So glad you guys are loving them :) thanks for much for sharing your feedback Abby!